The Spanish Association of Olive Municipalities (AEMO) presented the 2018 Prizes for the Promotion of the Olive Culture, sponsored by ORIVA. The awards ceremony took place under the auspices of the Olivo de Montoro Fair (Córdoba), and was attended by Felipe López, Minister of Development and Housing; Manuel Fernández, Jaén’s Second Vice-president and Promotion and Tourism Representative; María Dolores Amo, Employment Delegate at the Provincial Council of Córdoba; José Luis García, President of Caja Rural Jaén; and José Luis Maestro, President of ORIVA, who were accompanied by the heads of AEMO, led by their president and the mayor of Montoro, Ana María Romero, and José María Penco, Technical Director. For the first time in its 16 years of history, a 2018 Olive Culture Promotion Award was given to the Alameda de Obispo IFAPA (agricultural research and education centre) Global Collection of Olive Varieties. 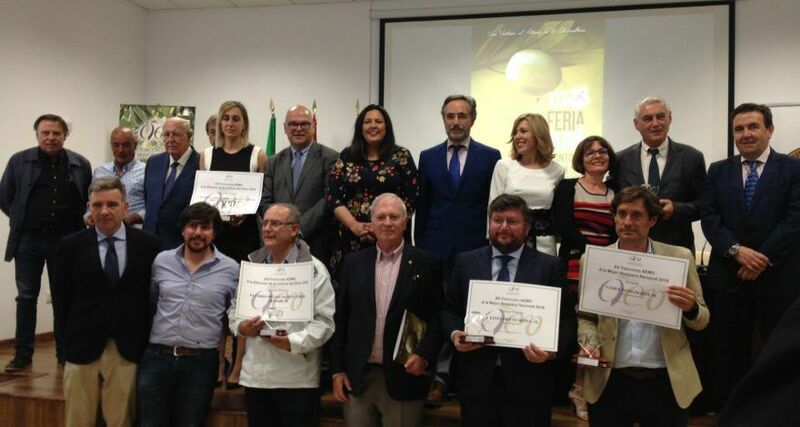 The first prize, bestowed by ORIVA, went to the apadrinaunolivo.org web portal of Oliete (Teruel); the second prize went to Colival, for the Culture and Quality of Olive Oil, Valdepeñas (Ciudad Real); and the third prize was for Liber Olivarum, The Book of Olives, by Arturo Esteve.